PEG Cleaning Brush is used to clean feeding tubes. This tube cleaning brush is manufactured by Bard and can be used daily or weekly according to needs. The PEG cleaning brush may be used to clean feeding tubes that are 20 French or larger in size. Cleaning solutions can be injected with the attached female hub adapter at one end. The cleaning end utilizes a feather mounted tip and brush. Constructed with nylon for strength and flexibility. Strong shaft optimizes push-ability to facilitate insertion. 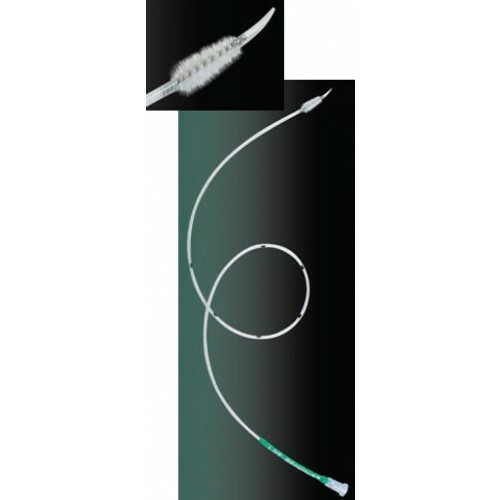 Feather mounted tip minimizes mucosal injury risks. Attached female hub adapter to inject cleaning solutions. Feather mounted tip with brush. Hub adapter for cleaning solution injection. What can you use for cleaning solutions? The manufacturer suggests simple saline solution for cleaning; however it's best to double check with a medical professional for the best advice. This can clean tubes up to 30 inches in length. Do you make these PEG Feeding tube cleaning brushes in any size smaller than 20Fr? The current available version through our site is available for cleaning 20 Fr sizes. We can; however, special order brushes for different sizes with the manufacturer if available. Is this brush compatible to clean an extension for an AMT mini ONE? We are unsure of compatibility for this product and an AMT Mini One. We recommend contacting the manufacturer or speaking with a medical professional before purchasing such an item. Always easy to purchase from Vitality. The brush is meant for 20f tube but I still can use it on a 18f. Squirt a little dishwashing liquid on the tiny bristle and it cleans the tube smoothly. One reviewer said this item was 30" long, so I had high hopes. However, the one I received was only 18.5" long from end of brush to the handle at the other end, so it is still 5" too short for me (and that 5" is where the worst deposits are). It is frustrating when product descriptions for items such as this don't give even the most basic specifications, such as in this case overall length and brush diameter. As long as you purchase the correct size this works very well. is 1/4" on the OUTSIDE of the tube. This little device has been a real asset in maintaining my wife's PEG tube. I highly recommend it. Brush works pretty good. Would be helpful if they could provide suggested cleaning solutions you can make at home or provide a web site where they can be found. PEG FEEDING TUBE CLEANING BRUSH does what it advertises. The brush did not remove the formula from the tube. Have tried the soda (ginger ale and coke) but the tube still has caked on food from overnight feedings. Any suggestions? It saved us when my mother's tube clogged at the stomach opening . Very useful to declog if plugged and for regular cleaning of the tube. The cleaning brush works, but it is too short to clean the whole length of the feeding tube. It would be great it there were different lengths from which to choose.